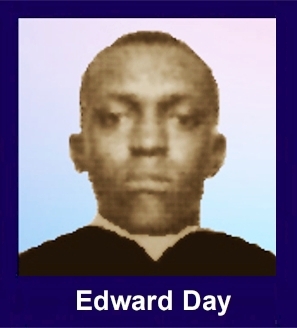 The 35th Infantry Regiment Association salutes our fallen brother, SP4 Edward Day, who died in the service of his country on April 3rd, 1968 in Kontum Province, Vietnam. The cause of death was listed as Multi-Frag. At the time of his death Edward was 22 years of age. He was from Flint, Michigan. Edward is honored on the Vietnam Veterans Memorial at Panel 47E, Line 48. The decorations earned by SP4 Edward Day include: the Combat Infantryman Badge, the Bronze Star, the Purple Heart, the National Defense Service Medal, the Vietnam Service Medal, the Vietnam Campaign Medal and the Vietnam Cross of Gallantry with Palm Unit Citation. Buried in the Morris Brown Cemetery in Charleston, SC. Charleston, SC is in the southeastern portion of South Carolina on the Atlantic Ocean. Take I-26 off of I-95 and go to the southern (eastern) end of I-26 where it intersects Rt 17 in Charleston. Turn west on Rt 17 until it intersects Rt 78 (King St) (Just a few hundred feet). Turn left (south) on King St and go about 1/2 mile to Morris St. Turn right (west) on Morris St. The cemetery is apparently attached to the Morris Brown AME Church at 13 Morris St.
Edward was born in Walnut Grove, MS.
Ed, I was in the 1st platoon "C" company 2BN 35th Infantry 4th Infantry Div with you, Was a few meters behind you, back in April 3rd of 68 when you and Arizona walked within shaking hands distance with the NVA. I never forgot you and the others after that tragic day. I can still here your words as we went patrolling along. "My Name is Day I don't Play" You were a no nonsense dedicated to duty Grunt. We miss you. For meritorious service in connection with military operations against an armed hostile force in the Republic of Vietnam. Specialist Four Day distinguished himself while serving as a Rifleman with Company C, 2nd Battalion, 35th Infantry, 4th Infantry Division during the period November 1967 to April 1968. Specialist Four Day demonstrated a strong working knowledge of infantry tactics and the desire to achieve maximum results on all missions in which he participated. Whether serving as the point man on a search and destroy operation, providing perimeter security, or assaulting enemy positions; Specialist Four Day maintained high personal standards and contributed significantly to his Company's mission. In addition, he adjusted well to the constantly changing situation and dangers inherent in a combat zone. His cheerful attitude coupled with his concern for the welfare of his fellow soldiers earned him the respect and friendship of his entire Company. On 3 April 1968, Specialist Four Day was mortally wounded during a search and destroy mission near Polei Kleng. His outstanding achievements, personal integrity, and exemplary devotion to duty are in keeping with the highest traditions of the military service and reflect great credit upon himself, his unit, and the United States Army.